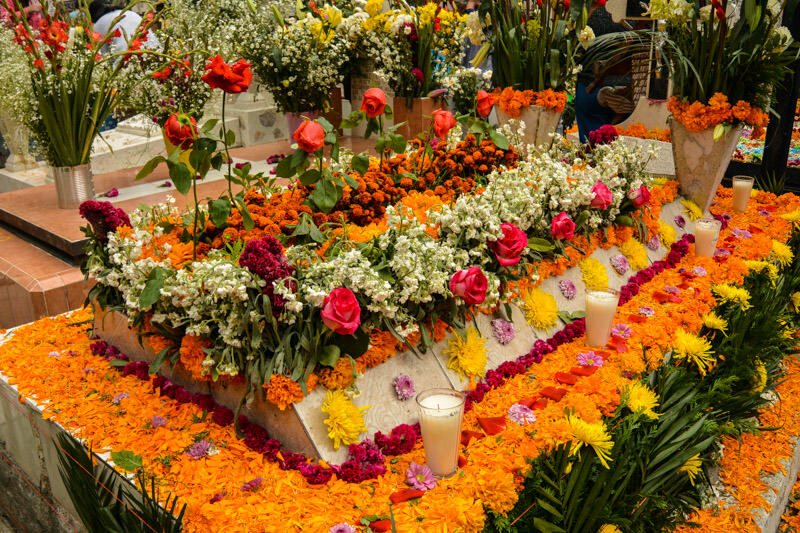 One of the most frequent questions I get asked about Mexico is where and how to celebrate Day of the Dead in Mexico. Because Day of the Dead is a centuries-old celebration that exists throughout Mexico (and in different forms, throughout Latin America), there are SO many options for places to experience Day of the Dead in Mexico, with each one unique. 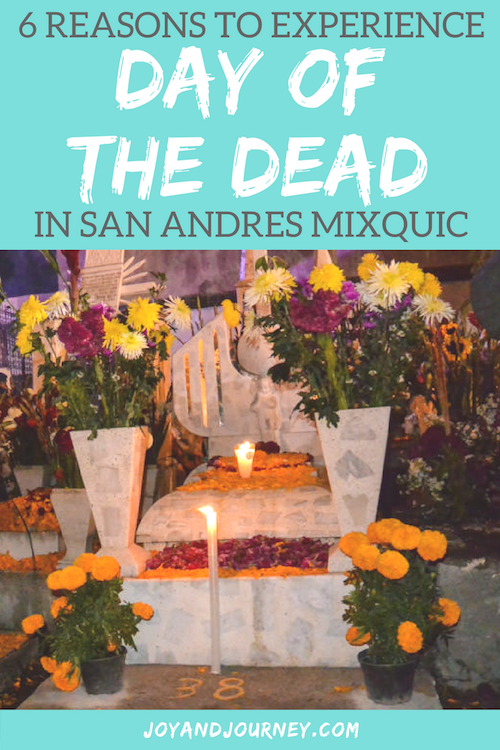 Considering as many factors as possible (including ease of access, openness to visitors, authenticity, and the beauty of the celebration), I’d recommend Mixquic as the ultimate place to experience Day of the Dead in Mexico. Even if you’re short on vacation days or don’t want to mess around with buses or domestic flights, you can still experience Day of the Dead in Mexico if you choose Mixquic as your location. 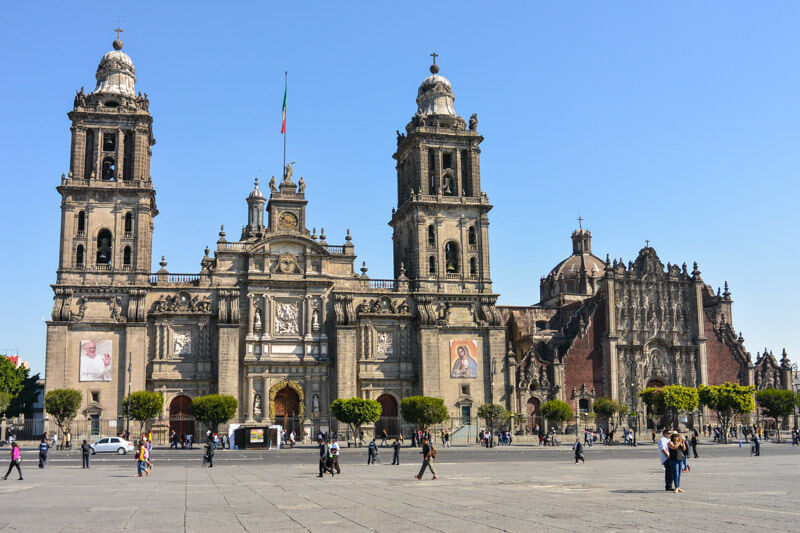 Simply fly into Mexico City, one of the most fun, best value, and best-connected (there are SO many inexpensive, direct flights into CDMX!) cities in the world. It’s one of my favorite cities EVER and chock FULL of activities even aside from Day of the Dead, making it a great place to base yourself. 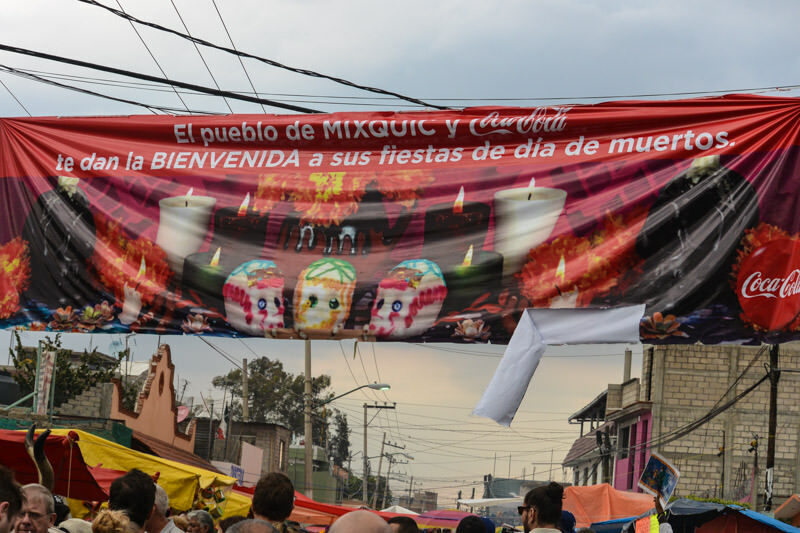 Mixquic, the site of amazing, traditional Day of the Dead celebrations, is located on the outskirts of Mexico City, and there are inexpensive, transportation-included guided tours to bring you to visit the gorgeous, authentic celebration that welcomes respectful visitors (or you can easily DIY your transport, which I’ll discuss below in #2). Mixquic, which itself doesn’t have much in terms of accommodation options, is the perfect place to experience Mexican Day of the Day if you want to base yourself in Mexico City (or you could also choose a different nearby city, like Puebla). First off, you’ll need to get to Mexico City: by plane, by bus, or by uber/taxi, depending on where you’re coming from. 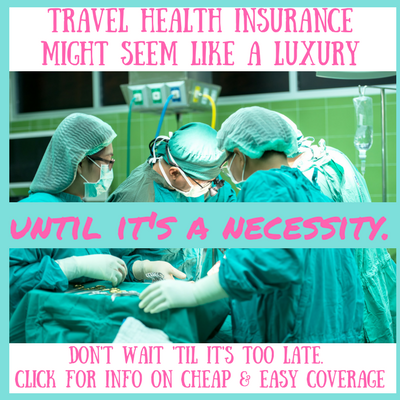 go with Viator (as I did) and they’ll arrange everything for you. Easy peasy. 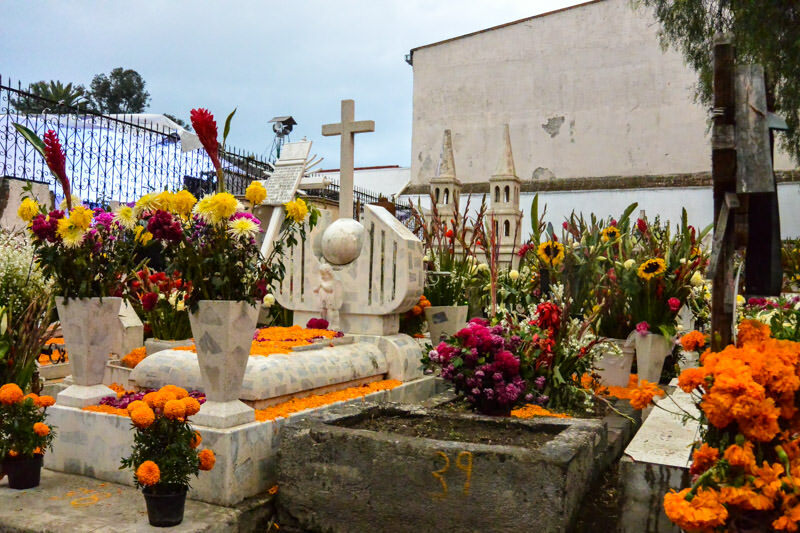 While doing the trip with Viator is affordable and the most low-stress option (you just jump on the tour bus and the guides do everything else), visiting Mixquic Day of the Dead really is a trip you can do yourself, I promise. This is a very important consideration when choosing where to celebrate Day of the Dead. In many smaller communities around Mexico, Dia de los Muertos is a more private, family affair, where a tourist’s presence would be at best awkward and at worst offensive. Mixquic’s celebrations are very open and welcoming, and are the perfect introduction to Day of the Dead for a first-timer. 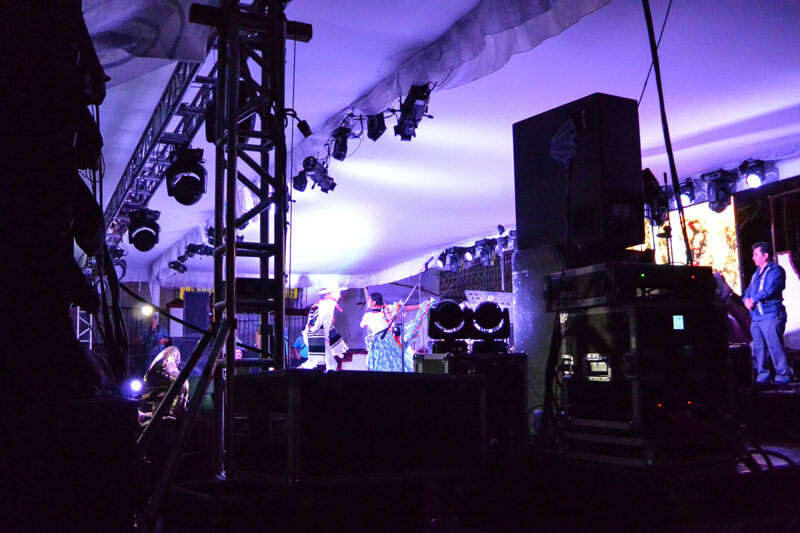 Mixquic was my first Day of the Dead in Mexico, and I am SO glad it was. I learned so much and felt very comfortable. As someone who is uncomfortable around death (that’s something I’m working on), and in big crowds, and concerned about not being culturally intrusive, I was a bit anxious before the holiday. I was so glad to find out that I had nothing to be worried about. The many food and trinket booths, and variety of activities (everything from pony rides to kids’ games and beyond), provided other distractions if hanging out in the cemetery felt overwhelming. I’ve also been to Oaxaca for Day of the Dead, and I have to admit I found San Andres Mixquic even more stunning, with so many colorful flowers used. The time, energy, and care (and money!) that goes into each of the grave decorations, and decorations around the church, is absolutely awe-inspiring. As a cultural outsider, I am NOT quick to classify anyone’s practice as authentic or inauthentic. However, there are many celebrations around Mexico that have been created specifically to satisfy tourists’ desire to see Day of the Dead, and are not actually part of a meaningful local tradition. This includes the James Bond-inspired Day of the Dead parade in Mexico City, which was started in 2016 as a response to angry tourists’ demand to experience what they saw in the movie, and staged performances in Cancun and the Riviera Maya. 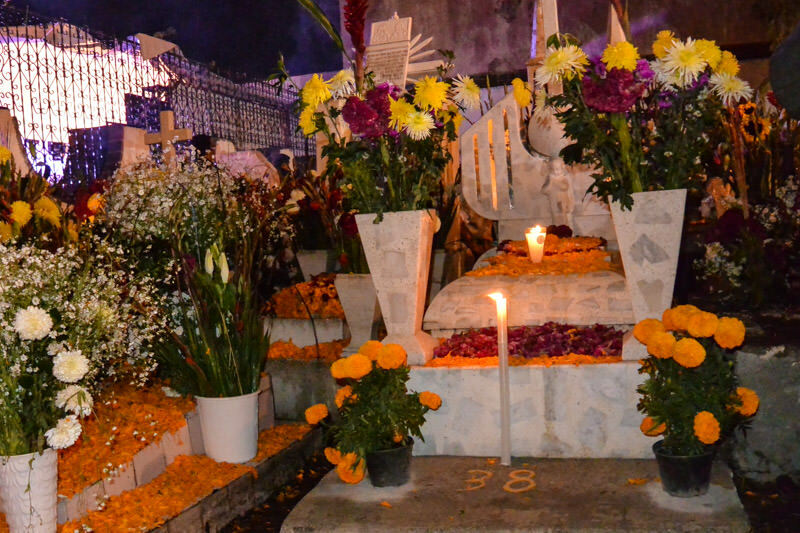 Day of the Dead in Mixquic is a long-standing, local tradition centered around the graves of loved ones buried in the church cemetery. Over the years it has grown and expanded, and recently more tourists have begun appearing, but it is still very much a local celebration, which is important to keep in mind. Tourists should always be aware that while the celebration has a festive air, the point is still to remember and celebrate lost loved ones, and respect for the sacredness and solemnity of this occasion is deserved. Do you have any more questions about celebrating Day of the Dead / Dia de Muertos in Mixquic? Feel free to post your questions here and I’ll add and answer them! Isla Mujeres Hotels: Where to Stay Without Breaking the Bank? I’d really enjoy those sugar skulls. Sound delicious. As for this celebration, it fascinates me. Neat to see how other cultures view death. I have seen it a few times on TV both via the news and also through a few TV shows, including Breaking Bad, I believe. People take it seriously, meaning they are all in on the celebration and the meaning behind it. I’d be recording videos too. Great way to preserve and share on your blog and YouTube channel because the Day of the Dead is quite unlike any ceremony on earth. Thanks for the rocking share Steph. Aw thanks so much, Ryan! It is really fascinating to me, too, and it made a big impact on me. This year I’ll be building an ofrenda (Day of the Dead altar) for my passed loved ones in my home, as I think it’s an awesome way to remember and honor them. This year I plan on taking a lot more photos and videos since I now feel more comfortable with what is and isn’t appropriate. It’s always tough to walk the line between capturing moments to share with my readers while also respecting the seriousness of a tradition, especially when in a new experience. 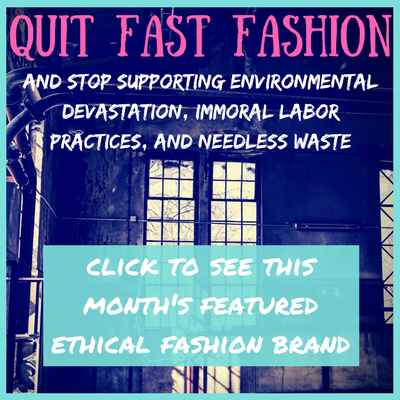 Thank you for this blog post!! My fiancé and I are heading to Mexico City in a couple of weeks. We were hoping to both see the big parade in Mexico City as well as enjoy a real Dia de Los Muertos experience in Mixquic on November 1. I have not been able to find any information online as to the exact day, time, location of the parade, I was hoping you maybe had more information on that? Any advice is appreciated. Hi Jessica! Last year, information about the parade wasn’t published until a week before (and even then, the time was off by several hours: it started very, very late). I’ve heard that this year it’s going to be October 28, but before that it was scheduled for the 29, and before that it was the 28 (again). Exact location still hasn’t been announced, nor time, but last year it started near the Angel of Independence. Mixquic is incredible – I am sure you guys will have such a good time! Last year it rained and I hadn’t thought to bring an umbrella or raincoat, so don’t make the same mistake as me because it was pretty wet and miserable by the end. Great article! Been searching for a while on best way to experience authentic Dia do los Muertos. My only question is when is best to go to Mixquic, on Nov 1? As I know the celebrations run from Oct 31 – Nov 2. Thanks so much and I’m glad I could help. Either day (well, technically, evening/night) will have the carnival and also the traditional Dia de los Muertos flowers and incense and candles in the cemetery. I’d recommend November 2, though, if you have the choice. The holiday on November 1 is dedicated to children’s souls and November 2 to adults’. Hi Steph, Great article! I’m coming to Mex City for Mixquic DOTD. I’ve been to the DOTD in Oaxaca and Patzcuaro and have enjoyed being there a few days before the celebrations to see the excitement in the build up and to photograph the cemetery preparations. Do you know if people ever stay in a hotels/hostels in/near Mixquic? And where are they/do any exist in such a small village? I’m looking online and the closest I can see are still 10km away, so I don’t know whether to stay in Mex City and travel out to Mixquic each day, which would be tiring or [now looking at] stay near the Xochimilco canals [also 10km away] where I can also ‘do’ the DOTD there and do shorter trips back and forth. What do you reckon? I don’t know that there would be any hostels or hotels in or near Mixquic – it’s really, really small and only “on the map” with tourists because of Day of the Dead. Traffic to Mixquic gets pretty bad during Day of the Dead, so if you want to go over multiple days, staying nearby (like at the canals, which also have their own celebration and could be interesting) is probably the best idea, though commuting in from Mexico City isn’t the end of the world. I’d recommend having a driver committed to picking you back up, though, and an agreed-upon place, the end of the night is a bit of a zoo in terms of cars/traffic in Mixquic. Please let me introduce to all, Im Giovanna Miranda, and Im from Mexico City, Im married and my husband George can provide you the service of Taxi Cab or Uber service, its safe, trustworthy and he can help you with the transportation arrangements ( pick up and drop off) on your visit to Mixquic. we are living near from Mixquic, and we know very well the area, so please, feel free to contact us if needed. you can reply to my comment and I can pass my phone number. I am interested in transportation from Mexico City to Mixquic on the 2nd if that is possible! Please provide contact info. Would love to learn more. Me and my friends want to visit Mixquic tomorrow night, we are staying in Roma. 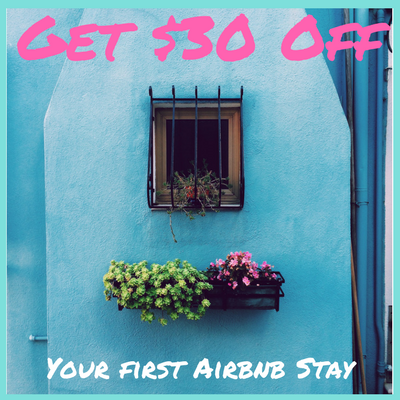 What are your rates? 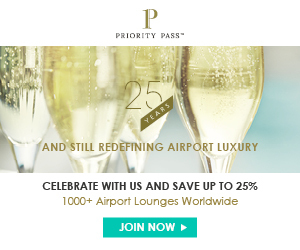 I think it would be great to pre-plan travel to have the best experience possible. Do you recommend going at a specific time? Can tourists dress up with the skeleton makeup, flowers, etc in Mixquic? Or I s that a major faux pas? Is it feasible to get dropped off early in the day & stay until night (is there enough going on to keep you occupied)? The traditional celebration of Day of the Dead doesn’t include dressing up. Getting costumed Catrina-style is a recent trend (probably due to the influence of Americana/Halloween/the James Bond movie). I did not see tourists dressing up in Mixquic, only a very few locals. However, with the growing trend towards dressing up, this year might be different than what I experienced. If you want to dress up for sure, I would suggest a more touristy celebration, like in Oaxaca. In Oaxaca, there were tons of face-painting stations and both locals and tourists were dressed up Catrina-style. In Mexico City, for the Day of the Dead parade, there is also a lot of face painting and dressing up. Sorry, I missed the second part of your question! Unless you’re really into shopping and eating, I don’t think there’s enough going on to keep you occupied for 12 or so hours and I’m not even sure if the booths are operating in the earlier hours of the day. Most of the celebration happens at night. I’d recommend going around dinner time (eat dinner in Mixquic at one of the stalls or little restaurants), and staying until 10pm or so. Later if you want to see more of the cemetery lit up. We are thinking going on November 2. 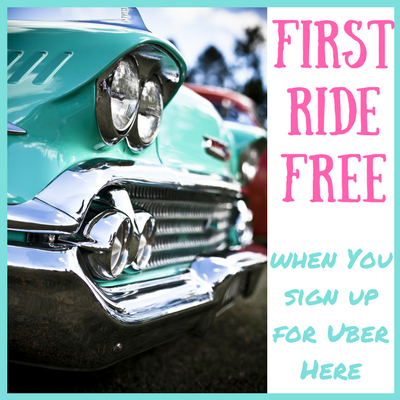 1.Do you know what is the best time to arrive? You mentioned everything is at night, so getting there at 5:00 pm is a good time? Or what time you recommend? 2. What time does the celebration end? 3.Also, how much time it took you to get From Mexico city to Mixquic? And from Mixquic to Mexico city at the end of the event? 4. Have you been to the Xochimilco celebration? Would you recommend it? 1. 5pm could be a good time to arrive, or even a bit later. 2. There’s not a posted ending time. The family celebration goes throughout the night. I’d recommend planning on leaving around 10 or 11. 3. It took about an hour to get to Mixquic, and about two hours to get back, due to traffic. 4. I have not been to Xochimilco for Day of the Dead, my experience has been limited to drunken boat rides on weekends, sorry! Can i ask a follow-up question on this? Did you drive yourselves or take taxi / uber from CDMX? Neither… I took a tour that included transportation from Mexico City (this one from Viator) because I wanted things to be as easy as possible. Hi Nicola! The Viator tour I link to is in English, so no problems there. Because it is run through Viator, it is EXTREMELY reliable, and you can contact Viator with any questions/concerns: they are very prompt. This article lists everything you need to know about Day of the Dead in Mixquic, including tips on what to bring. I hope you have a great time! Hi! I am planning on going and I’m super grateful for this post! I haven’t been able to find a government website of the dates for día de los muertos. I know it’s a few celebrations from Oct31-2 however do you know which date is best to go this year? Hi Tere! It depends on the location you’re visiting, as every town/village celebrates differently. The most standard dates are November 1 and 2. Hi Stef, after reading this article we’re definitely going to do this (in just a couple of days!) one thing I’m struggling to understand is exactly the day to be there if the want to catch the candle lighting at midnight/1am. Would it be throughout the day of 1st and into the night of 2nd? Or 2nd and 3rd respectively? Also hoping we can get an uber back to the city if we do stay until the early hours after the candle lightning ceremony. Where did you hear about the candle light ceremony? When I visited, all the candles were lit at sunset. I did leave around 10pm or so, though, so perhaps I missed something. I would recommend double checking with whoever told you about this ceremony that outsiders/observers would be welcome. last question – does Viator allow you to visit the cementary? Didn’t see this on Viator so want to confirm before that happens since that is why we are going! Hi Natalia! Yes, with the Viator trip you have the opportunity to go to the Mixquic cemetery. If you go, I’d love to hear what you think!